I have undoubtedly drunk Moscatel do Douro before, but I must have thought they were either Douro DOC wines or varietal white Ports, because it came as a bit of a surprise to discover that it has its own DOC. The wines are made from at least 85% Moscatel Galego Branco (AKA Muscat Blanc à Petits Grains), and have their fermentation stopped by fortification to at least 16%, but typically less than Port. 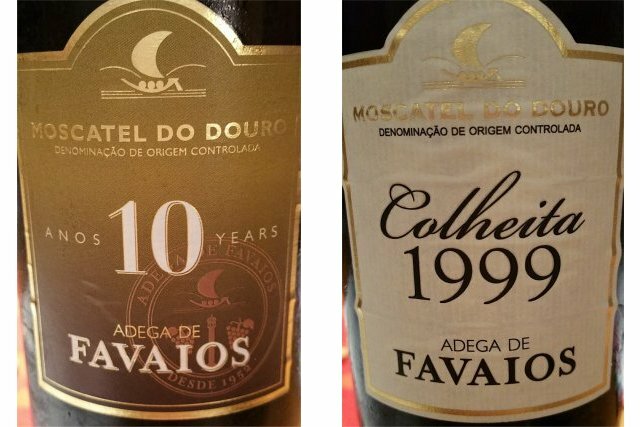 The wines described below were brought back from the Douro by a friend, and offered for tasting at my local wine group. The parish of Favaios lies roughly 10km to the North of Pinão, in the Cima Corgo region of the Douro, and Adega de Favaios is a coop winery located there. It is probably best known for its range of Muscats, but does also make other wines. The producer Fragulio is also from the area just North of Pinão but, unlike Adega de Favaios, it is a family run business, and this is its only Moscatel. So not wines that I will be dashing out to buy, but it was interesting to try a few side by side. However, nothing much wrong with them though, and others were a lot more positive than me. I am a lot more fussy about sweet wines than I am with other styles, tending to favour those that achieve balance through extremes of acidity and sweetness – unlike these wines, which were more moderate in both respects. This entry was posted in My tasting notes and tagged douro, muscat, portugal. Bookmark the permalink.